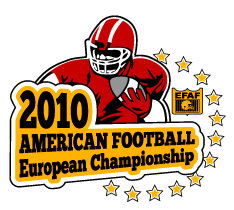 After the conclusion of the A-pool European Championships 2010 EFAF president Robert Huber in a letter to EFAF members and officials has thanked everybody involved with EFAF and especially the members of the Organizing Committee. The tournament at Frankfurt, Wetzlar and Wiesbaden in total has attracted more than 25,000 visitors to its nine games, attendance figures that outnumber any European American Football tournament of the past by a large margin. The final game of EC 2010 set a new attendance record for EC finals itself, eliminating a 19-year-old record mark. Like the opening game and the game for third place it was staged at Frankfurt's Commerzbank Arena, the first time ever games of an EFAF tournament for national teams were played at an elite venue which was in use for FIFA World Cup before. In his letter Huber states that „EFAF reached the next level in our federation history.“ This does not only refer to attendance figures, although obviously the public is focussed on such numbers and especially the short-term comparison to the 2005 A-pool tournament (4,100 visitors to 4 games) and the tournaments since the late 90's is impressive. But also this year's EC final game was aired live on Eurosport 2 throughout Europe for the first time ever and even with the expansion from four to six teams in the final A-pool tournament again noticeable progress in the level of play of all the teams was visible. „We saw a lot of exciting and close games“, Huber was just as delighted as anyone else with the tournament. For the EFAF Board of Directors, which invented the pooling system for the European Champioonships about a decade ago, another point was of great interest: „The success of Austria showed that a federation can start at the C-level and advance to a Bronze medal“, Huber explains. With Austria's success the pooling system in only its second cycle definitely proved to be an appropiate system to determine the true champion of Europe. Which - for a third time in a row - in the end was the host of the final game. But while Huber of course has to greet his fellow-Germans with „congratulations to Germany for winning the championships and organizing the best ever European Championships“, the Germans were not the only nation with reasons to celebrate. France won its first ever medal on senior level, and Austria not only had the Germans at the brink of a loss in the opening game but subsequently went on to win its first medal since 1995. Both teams rise to the medal ranks on senior level came as no surprise: The French had won the Junior Championships in 2004 and 2006, Austrian club teams won the Eurobowl six consecutive times from 2004 to 2009 - it was a matter of time the continous efforts both federations made in the past had to translate into success within the European Championships for senior national teams. The reward for hosting the events may be a tournament victory as the recent past indicates - but the effort in staging such tournaments may not be underestimated. „Without a lot of volunteers those achievements cannot be reached“, writes Huber. „We have to thank everybody who was involved in this tournament"